The Best Bug Out Vehicle - How Will You Get Around in a SHTF? 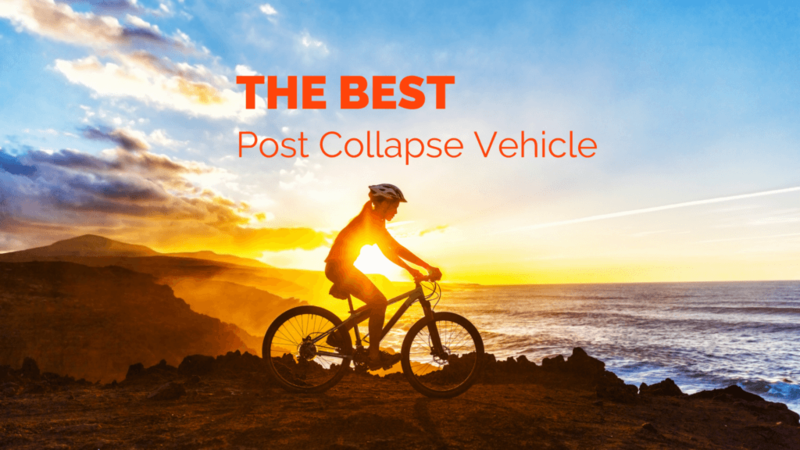 The Best Bug Out Vehicle – How Will You Get Around in a SHTF? Fuel is going to be in short supply following any kind of collapse. It doesn’t matter what the event was. Once this occurs, you’re going to have to find some form of transportation that doesn’t rely on gas or diesel. The simple fact that a bicycle doesn’t need fuel makes it the best bug out vehicle . Every prepper should have some kind of bike. Even if you plan on bugging-in, there could be any number of reasons why you would end up bugging-out either immediately or sometime following the event. What type of bike should you get? Is a bike trailer right for you? If you do end up bugging out, it’ll be much easier to transport your bug out bag on a bike than it would be to carry it for who knows how many miles. I would suggest a mountain bike as they are perfectly fine on the road and still maintain the ability to go off-road when needed. A decent hardtail fits the description of best bug out vehicle perfectly since you’ll most likely be riding with your bug-out bag and possibly pulling a trailer. A hardtail is a mountain bike that has a front suspension that can help absorb a lot of shock and no suspension on the rear. A lack of suspension on the rear actually allows you to get more power to the wheel when pedaling compared to a bike with full suspension. They’re also significantly less expensive. I also recommend disc brakes as they make a world of difference when stopping. Hydraulic disc brakes are even better if you’re willing to spend a little more to get a bike that has them. Another option for a bug out vehicle would be a folding bike. The obvious advantage of a folding bike is that it can fit in a smaller space than a normal mountain bike. The disadvantages are the fact that they normally don’t have as many options as a traditional bike. I think the folding bike is interesting as it could fit in your trunk so you could always have a bug out vehicle with you. Having a folding bike gives you another option to get home in case of something like an EMP or if the roads are completely blocked by vehicles. If you have small children that cannot ride their own bike you may want to consider a bike trailer designed to pull children behind you. These trailers are similar to an off-road stroller and can pull around 100 lbs. If your family doesn’t have any small children, you may still want to consider a trailer. There is a wide variety of trailers available for bikes. They range from open wagon styles to trailers with pop-up tents. Again, with this style of trailer, you’re looking at being able to pull around 100 – 120 lbs. A little more cargo capacity can be added with saddlebags or racks. This could be a good option for those that don’t want to add the cost or weight of a trailer. In my experience, the more weight you can move from your backpack to a saddlebag or trailer the better. A bicycle dynamo like this one will allow you to charge a battery pack through a USB port. With a little ingenuity, you can rig up a bicycle-powered generator as well. This video by southernprepper1 shows how to make a bicycle powered generator. Several people have mentioned that a bicycle is not the best option. They believe that a horse is the best vehicle following a SHTF event. I considered talking about horses as a possibility, but they’re not ideal for quite a few reasons. Many of us simply can’t keep a horse around in case of a collapse. They require tons of maintenance, a lot of land and are expensive to buy and own. American Association of Equine Practitioners estimates that a single horse will cost about $2,500 annually! That’s 5 times what a decent mountain bike will cost you. Other associations put the estimate closer to $3,500. Other people have argued that you can get a horse for free after a collapse occurs. I just don’t see that as an option. Horses will be even more expensive in a SHTF. If we take a look at places like Afghanistan, a place that you could easily argue is already in a state of SHTF, livestock and animals are expensive. Not everyone can afford them, but everyone is riding a bike. What do you guys think is the best bug out vehicle? If you’re looking for more preparedness articles, you can find them here. You can leave a bike sit in your garage for a month and all you have to do to ride it is pump up the tires. You have to feed a horse every day and every day you have to remove what the horse deposits as a result of feeding. While it is true that you can take a horse places you can’t take a bike, if you are going to be going that far into the wilderness, you would be better served with a mule. They can carry more weight than a horse. They are far smarter than a horse and while I am not a veterinarian, I understand they are less susceptible to illness than a horse. My vote is still for a mountain bike with saddle bags and a trailer. The North Vietnamese Army moved tons of supplies hundreds of miles with bicycles. They are the most energy efficient cargo device invented so far by man. You can see cross-country riders carrying all their camping gear and clothing for a several weeks to a couple of months trip across the U.S. every summer along the transcontinental routes. You’re correct on every level. You also don’t need to try to convince a bicycle to be quiet if people are passing. The bicycle is pretty much the one universal mode of travel across the world.